Kickstarter Project Encourages Female Engineering #makerbusiness « Adafruit Industries – Makers, hackers, artists, designers and engineers! Kickstarter Project Encourages Female Engineering @ Business Insider. Debbie Sterling didn’t know what engineering was when her high-school math teacher suggested it as her college major. She would eventually become not only an engineer but the inventor of a popular girl-friendly engineering toy poised to disrupt the “pink aisle” of toy stores. The success of her toy, GoldieBlox, is one that even industry analysts could not have predicted. Born of a conversation among women engineers about how to grow their numbers, the toy went from Kickstarter crowdfunding project to the shelves of Toys ‘R’ Us in less than nine months. 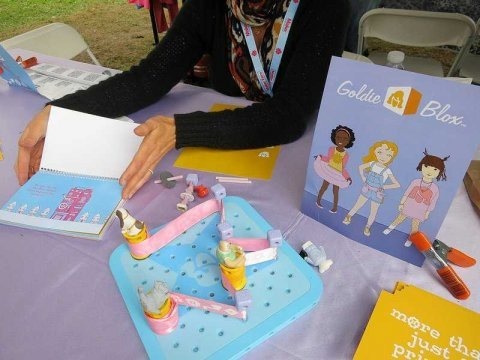 The toy, which combines a storybook about a girl engineer and her friends with a construction set, had $1.5 million pre-sales by the end of theKickstarter campaign, and sold about 50,000 as of early July 2013.